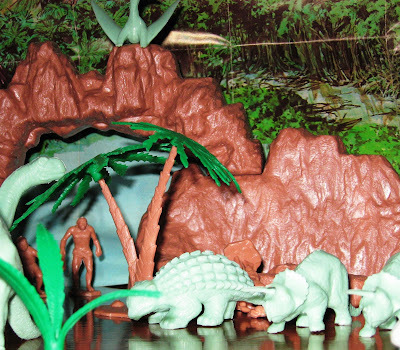 To this day, I cherish memories of an early birthday (I must have been four or five years old...) when I received this glorious "Prehistoric Play Set" sold and marketed by Louis Marx & Co., Inc. 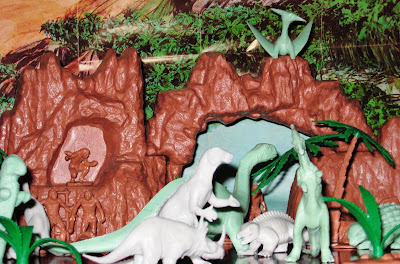 In particular, I have very distinct memories of opening up the huge playset box in our living room at Clinton Road, seeing the contents, and playing madly with the dinosaurs (and cave-men) inside for hours, even as my granny visited. I seem to remember that my granny gave me the set, but my memory could be confused in that regard. As a child, I was absolutely obsessed with dinosaurs, so this was the perfect gift. 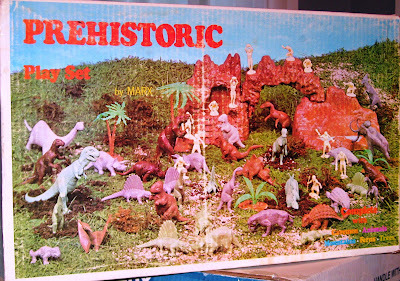 This huge prehistoric Marx playset (tagged as Style 3398 on the box -- whatever that means...) comes "complete with Cavemen * Animals * Mountains * Ferns * Trees." Among the dinosaurs included (molded in green, grey and brown...) are the Allosaurus, the armored Ankylosaurus and Stegosaurus, a Dimetrodon, an Iguanadon, the duck-billed Trachodon, the horned Triceratops, a Brontosaurus, and a Styracasaurus. There was a T-Rex, a Woolly Mammoth, and even a sabre-toothed tiger too. Now, you may realize that these creatures didn't actually all exist in the same time period (and certainly not concurrently with cave-men...or Jesus), but as a kid I didn't care much about the scientific accuracy of the toys. Simply put, this was Skull Island, the Lost World, the Land of the Lost, Monster Island, and the Valley of the Dinosaurs all rolled into one great toy, and I spent many a day sending in "modern" plastic tanks and soldiers to battle these small plastic behemoths. Somehow, I had managed to hold on to one squatting plastic caveman (!) from this set for over thirty five years, but I recently acquired a complete playset on E-Bay. Don't tell him yet, but this is going to be one of Joel's birthday presents this October. 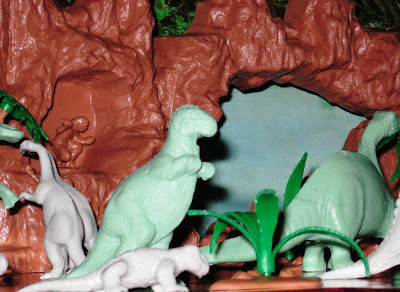 I figure Age 3 is the perfect time to introduce my little boy to Marx's "Prehistoric Play Set." Should be a great gift. I can remember as a child in the 70s that two of my favorite toys were my Marx Fort Apache and Battleground playsets. I also had the "F-Troop" magnetic action Fort Courage playset. All provided endless hours of fun for an imaginitive boy. Let me know when Joel’s birthday comes around so I can get him this t-shirt to counteract your godless socialization. What a coincidence. I just stumbled on this set at a toy show I went to a couple of weeks ago. I remembered getting this one as a kid as well and also spending hours upon hours playing with it. I almost bought it for my 5 year old son, but he is so much into video games already that he hardly plays with toys like this anymore, even though he loves dinosaurs.